Aldi may have seen its UK profits drop last year, but shoppers spent an extra £1bn there compared with 2016. We meet the man driving the discount supermarket's rapid growth. Aldi doesn't sell a very wide range of products so the bar is set high for any new one to make it to the shelves. It's the UK chief executive Matthew Barnes who does the final test in the sleek tasting kitchens at its Atherstone HQ. He not only personally approves every new product, but sets the price for it, too. This forensic approach appears to be working. Last year sales rose 13.5%. It's the sort of growth that the big established players can only dream of these days. Right now, it's opening more than one store a week with the aim of having a thousand stores by 2022. And often in places which already have one Aldi, or sometimes even more. Take Glascote, in Tamworth, Staffordshire, just down the road from its Warwickshire HQ. There's an Aldi close to the station but the company recently opened a new one just a couple of miles away. Says Mr Barnes: "Our first store has been there for more than ten years and was really over-trading. It was really, really busy and we couldn't expand that store. So, we opened this store down the road. Meanwhile, sales at the first store have dropped a small amount. But, overall sales in Tamworth are up more than 80% and that's absolutely the right thing on every level for us to do. "More and more customers are doing their main shop in Aldi. It gives us the confidence to invest in the UK because the potential for growth is fantastic," he adds. Aldi, like its rival discounter Lidl, is a German business and privately owned so doesn't have to answer to shareholders or the city. It also means that it doesn't have to disclose like-for-like sales as its rivals do. This is the performance of stores that have been open for more than a year, which is the sales measure most closely watched by analysts, and some have questioned Aldi's underlying rate of growth. But the boss is happy to keep rivals guessing and says he is more than content with the performance of the business: "We're delighted because 2016 was another record year for Aldi. We managed to attract a further million customers through our doors in a year and those customers have come from all over the UK, from all age groups underlying our status of a universally appealing supermarket," he says. Aldi stocks around 1,700 products, compared to the 20-30,000 items you find in a typical big supermarket. And 94% of these are private label. Not being beholden to big brands enables it to buy products more cheaply - passing on the savings to customers while still making decent margins. The chain opened its first store in the UK in Stechford, Birmingham 20 years ago. But it wasn't until 2008 that Aldi started to make headway when it decided to up the quality and range of its produce, enabling customers to do a full shop. When the recession struck, Aldi and Lidl benefited as shoppers became more careful with their money. Opponents vent against Aldi's own label products where the packaging looks incredibly similar to the big household brands, and supermarkets have complained about its advertising tactics. But that hasn't put off shoppers. The big four supermarkets - Tesco, Asda, Sainsbury's and Morrisons - have been fighting back on price, narrowing the gap at the till, especially on the key everyday essentials. But Matthew Barnes is adamant that Aldi will always be cheaper. That's one reason why its profits fell. "Profits are down and that's because of very challenging times last year particularly post Brexit. "We invested a huge amount to keeping our prices the lowest in the sector. We view that position of having the lowest price in the market as the contract we have with our customers, and whatever happens and whatever challenges arise we maintain that price gap," he says. Aldi knows it can't take its eye off the ball on price. Its whole business model depends on being cheaper than the traditional supermarkets. "The big supermarkets know they can't afford to let their guard down. The discounters effectively have a foot on their throat, which means that they can't pass on price increases as easily and blithely as they had in the past." Another reason for the dip in profits is that Aldi is pouring money into new stores and upgrading some of its tired looking existing shops as well as building new distribution centres, including Sheppey in Kent, to support its growth in the south east. It is investing £1bn over the next two years. The Glascote store has been the test bed for the new look Aldi supermarket. It's spacious and has an upmarket feel, featuring lines of chilled cabinets where products can be more easily seen. But is Aldi at risk of falling into the trap of complexity by building bigger, better stores and adding more products? "The crucial thing is that while the stores are now bigger, the range is very tightly controlled and therefore all the focus is on having more of the same product in there to meet the demand," says Mr Leyland. 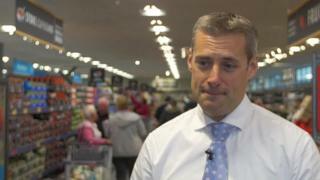 But he says the chain needs to balance improving the shoppers' experience with costs. "What they've got to wrestle with is to decide how much money do you need to spend for it to be an acceptable experience." Collectively, Aldi and its discounter rival Lidl now account for £1 in every £8 spent in Britain's supermarkets according to research firm Kantar Worldpanel. A decade ago this was only £1 in £25. Aldi is no longer the plucky underdog. It could even leap-frog Morrisons to become the UK's fourth biggest grocer within a year or two, believes one respected city analyst. The bigger and more successful it gets, so the scrutiny will grow too. The big four have been cutting costs as they work to simplify their businesses. That's included heavy job losses at all of their headquarters. At Aldi's head office, construction workers are putting the finishing touches to a new glass reception for a building that is more than doubling in size. For now at least, like the flow of lorries from the distribution centre next door, this grocer is on a roll.